Marble Maze levels 3 and 4 Please note: there are more levels... I will put screenshots up as soon as I can. 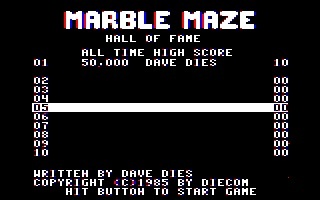 Marble Maze is based on the arcade game Marble Madness. In this strategy/arcade game, you must steer your marble through a maze, dodging obstacles and opponents, to the finish line before a time limit expires. The mazes are several screens long, and you scroll vertically through them as you navigate. The further into the game you get, the more complicated the levels become, by adding brand new obstacles and monsters to get around. Requires: Color Computer 1,2,3, 64K RAM, disk or tape, joystick. Download MARBLMAZ.BIN. Type LOADM "MARBLMAZ" and then EXEC to run. Please note that I have tried to 'unhack' the score screen, but I am not sure what was on the original game.